You’d think I would have learned the importance of how you make people feel back in fifth grade. Back when I suffered the social consequences of making a friend feel badly. But no. I guess I don’t learn very fast, after all. “Just a sec.” I almost dropped the phone in my haste to run to the living room and ask Mom. She nodded her permission to my breathless request, and I rushed back to let Kelly know I would leave immediately. Fifteen minutes later, we stood outside the corral and watched a beautiful black horse toss his silken mane and snort at the newness of his surroundings. “Treasure,” Kelly replied in her soft Southern accent. I’d only lived in North Carolina for six months, and my Pacific Northwest brain hadn’t learned all the nuances of the Southern dialect. “No. It’s TREH-sure and MEH-sure,” Kelly assured me. I shook my head in disbelief, but swallowed any further corrections. After all, I wanted to gain permission to enter the corral and pet the horse, regardless of his name or how my misguided friend pronounced it. That evening, I explained to my parents what had happened. “Who’s right?” I asked. I dug out the dictionary and found ‘measure’ first, since M comes before T. Much to my surprise, it had TWO acceptable pronunciations for both words. Kelly and I had both pronounced the words correctly. Of course, MY pronunciation came first, so that meant I was most right. I couldn’t wait to share what I’d learned with Kelly the next day at school. “We’re both right,” I shouted across the playground. “About what?” Kelly answered, running up to me. “According to the dictionary, you can say ‘measure’ and ‘treasure’ both ways,” I announced with authority. Kelly shrugged her shoulders, unimpressed with my revelation. Kelly walked off, mumbling something about the horse’s name being ‘TREH-sure,’ regardless of what the dictionary said. For the rest of the year, Kelly seemed distant and not quite so friendly. In fact, she didn’t invite me to her birthday party. Forty-two years later, I finally understand. Being right isn’t as important as how you make people feel. My need to share information overwhelms my common sense. I measure my worth by what I know. The Pharisees knew a lot back in Jesus’ day. They knew the law, how to tithe correctly, and how many steps they could take on the Sabbath. Unfortunately, their knowledge and attitude kept them out of the Kingdom. The measuring device I treasure most is how Jesus treated people. It’s time to throw that other yardstick away. 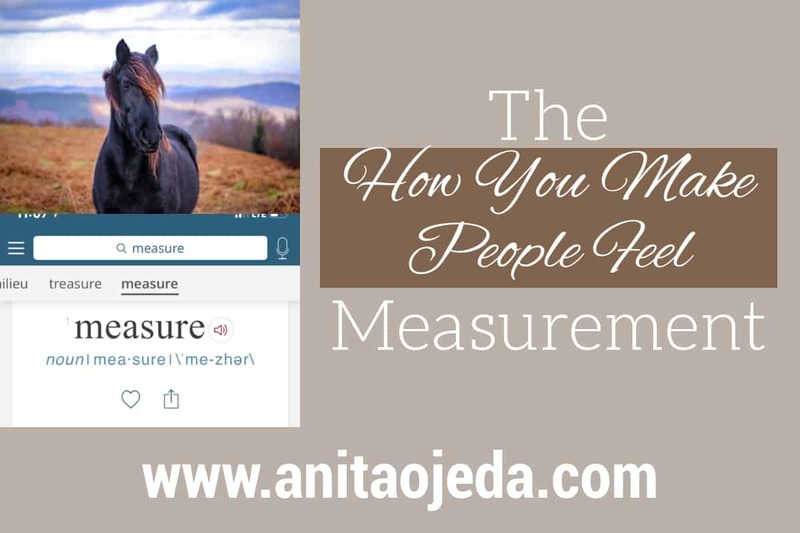 “The measuring device I treasure most is how Jesus treated people. It’s time to throw that other yardstick away.” Yes, sometimes it’s so hard when we know we are right, but sometimes it’s so much better to let it go and think about the feelings of people. I wish we could remember that all the time. Blessings to you, Anita! Thanks for sharing this important truth. This is so good, Anita (and a really funny story, too 🙂 ). That “rightness” yardstick is really hard to give up, but it does not bode well for relationships, as you say. Jesus had a different approach altogether. It’s crazy how a lot of words have more than one pronunciation. I really enjoyed this post friend! Isn’t it crazy how some stories from our childhood carry such meaning when remembered as adults. So true — being right isn’t as important as being kind. Great post! You should hear me talk being from Georgia, no wonder people don’t understand me as a writer, there’s no way I could speak as write, most people are just not going to be that deep and poetic. And if you become self conscious about it, you’d miss so many opportunities, I know I have in lots of ways. I remember a conversation similar to this with a good friend years (and years) ago. When I reflect on it as an adult, I can only slap my palm to my forehead. I was able to apologize for my insensitive comments, and she did forgive me, but the pain still existed. Thanks for sharing this story with us! And reminding us that our words do matter.